A typical florist often operates on a small, local scale and likely has competition from various sources. In today’s world, this means you may have to fight for your visibility and to get noticed in the crowd. So, how can you improve your visibility online? Let’s explore some of the best methods available for you, to help ensure customers can always find you and make their way to your physical premises. Florists represent a business that have strong overlap with various events and special occasions. For example, we can all recognise a strong correlation between roses and Valentine’s day. Needless to say, there’s great potential for unique and powerful content. Working in partnership with a responsive SEO agency, florists can offer their own insight into the various products that sell at various times of the year. This can then be used in videos, blog posts and external articles to offer various guides and useful information. What are the right flowers for a wedding? How do you choose the right flower for a unique occasion? These are things people might want to know. This can be used to create your own blog posts, targeting relevant keywords (especially in the long-tail region) and drawing traffic from a variety of sources. 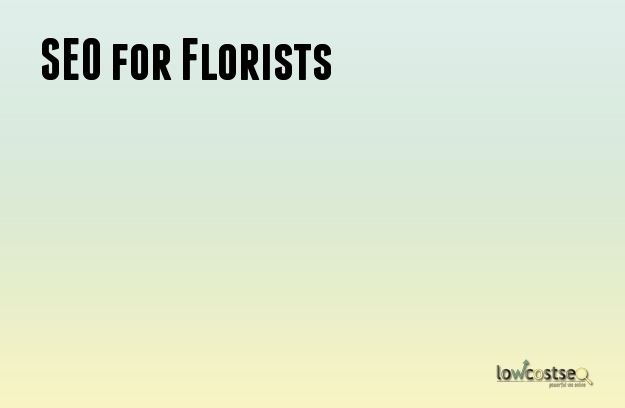 Florists have a very strong local presence – after all, it’s hard to ship flowers far away and keep them fresh and vibrant. As such, a lot of your SEO efforts should look to ensure your location is easily defined. This should involve clearly stating your address on your own website, social media and third party listings. The more coherent this various data is, the more search engines can accurately tell users where you are – this will certainly help improve walk-in business. Furthermore, getting a prominent position on local search will be vital. Think about how many people need to buy flowers quickly – they’re going to look for whoever is closest. While this does mean mobile searching is important, it’s getting on to Google maps (and even a three-pack result) that will be the most beneficial. We’ve already mentioned that florists have specific products that peak during various seasons. Well, it’s more than likely that the keywords and search queries also rise and fall in sync with this, so why not use this to your advantage. Pay Per Click advertising – PPC – can be used to further promote your business. Google Ads, for instance, can be used to display seasonal promotions, advertising certain products with specific days or periods that get a lot of visible searches. With the right promotion and advert, you can easily increase your traffic and visibility. Of course, there are many forms of PPC. You can also use Facebook Ads, for instance, to further benefit from social media, targeting local people and, if needed, further defining this specific audience. By using the various PPC means at your disposal, you can better target your paid promotions.